Nicolas Cage seems to be unfazed by appearing in lower budget projects that may damage his future chance of landing the big picture deal, and has been quietly making these smaller budget movies which often go direct to home release via Video On Demand services from the likes of Netflix etc. Mandy is an altogether different project. Whilst initially enjoying only a modest release in a handful of movie theatres, the fans went wild for this film. The usual plan with direct-to-home releases is normally just to run a limited two week deal at the cinemas (or should I say multiplexes) and then the company behind the work sit back and let the VOD takeover before it gets the full-blown home disc release with all the trimmings. 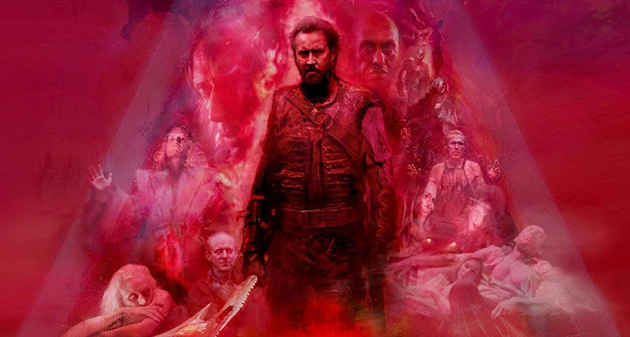 Mandy has set new standards for VOD as not only has it gone onto break the record for taking in the theatres for a VOD property but the fans liked it so much that they petitioned the director to get a wider release platform, so great was its appeal. 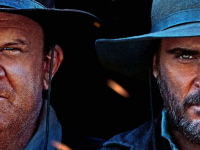 ‘Mandy’ is being hailed by some as a career-defining role for Nicolas Cage. Mandy is the story of a loving couple in the 1970s who live out of way deliberately just wanting the simple life and the quiet charms that deliberate seclusion can offer. Nicolas Cage is known for his ability to give us full-tilt lunatic on screen but sometimes it might feel slightly out of place or unneeded. 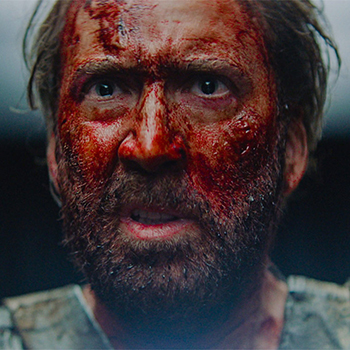 Well, the terror ride that is Mandy is the perfect place for Cage to go full tilt; and boy does he. Cage plays Red Miller, a logger working hard to bring home the bucks. His wife, the film’s namesake Mandy, is played by Andrea Riseborough, is also hard at work during the day at the local store; two loving individuals equally sharing the responsibilities in order to maintain the quiet slice of idyllic seclusion they have achieved with their small bungalow and garden hidden away beside the forest. Red and Mandy enjoy nothing more than chilling out with a cuddle and a tune of an evening. The 1970s are everywhere in Mandy from the clothing to the décor in the bungalow Red & Mandy live in, through the cars and music. It’s even shot in such a way that it looks like old film stock of the period being slightly soft around the edges or perhaps just not up to the definition that were used to today. 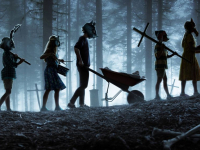 In Mandy when the night comes so do the monsters. The film plays like a true bad trip LSD-laced nightmare, complete with the local surroundings being washed into a hellish landscape that wouldn’t be out of place in an episode of the computer game franchise DOOM. The local cult leader just so happens to be in town and along with him is his drug crazed followers. And that’s not just his delusional flunkeys but a crew of hellish bikers that wouldn’t be out of place alongside Clive Barker’s Pinhead and his Necromancers. When the movie really gets going, the LSD-inflected visuals are literally leaking out of the screen. The film also features the last completed score by composer and experimental musician Jóhan Jóhannsson, helping add further depth to the films unsettling tones, jarring and sharp in all the right places. I highly recommend coming along with Red Miller as he seeks out his just revenge upon the drug fuelled lunatics that ended his simple life and unlocked the demon that dwells in us all?